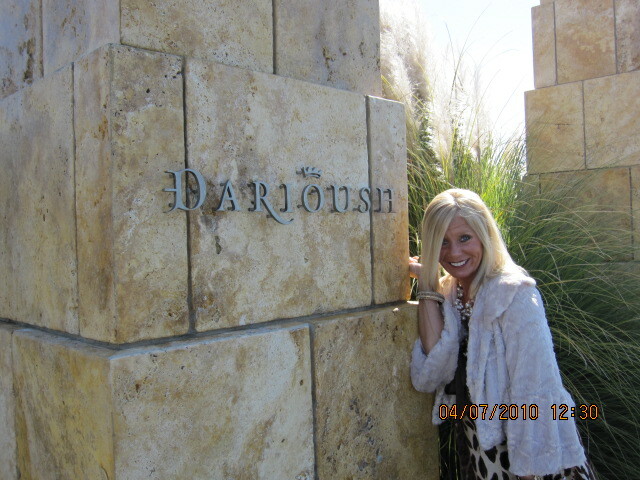 During my visit to Napa Valley, this was one of my first winery’s to make a private appointment with. Darioush produces some of the BEST Bordeaux style wines. I have been drinking for many years. Darioush Khaledi grew up in Shiraz, one of Iran’s prominent wine-growing regions. With his family passion Darioush became a devoted wine collector of fine wines. Darioush left Iran in 1970’s and emigrated to Southern California. Darioush and his brother-in-law own and operate one of the most successful independently owned grocery business. He then decided to take his passion of collecting fine wine to producer. He had his visitor center built with much of the structure was brought in from Iran and other exotic places. After five years of building he opened the new center in 2004. The architecture is stunning with Persian flair, 22,000 square feet, which evokes Persepolis, the illustrious capital of ancient Persia. From the long drive-way, gorgeous pillars and fountains outside this was one of the most beautiful places I have ever seen. From the massive building so meticulously structured and landscaped to perfection. This picture is where we were greeted by the lovely “Marisol” who gave us our private tasting and tour. She has a display of cheese & crackers awaiting us with chocolate as well. She was the perfect fit for us. Warm, friendly, knowledgable, and a true delight. Our tasting experience began. After our amazing tasting sitting next to a gorgeous fireplace Marisol suggested to take us down to the wine cellar and Darioush private wine cellar. Walking down the marble staircase through a wrought iron gate made me feel like I was in a dream. Something about this place for me was just so magical. I felt a warm peace and tranquility during our entire visit which lasted about three hours. The private cellar with table in the middle was stunning, his collection of wines were remarkable. I wanted to stay lay down in the middle of the room and bask at each label. Marisol went to retrieve about six Riedel stems and she surprised us by allowing us to taste several wines out of the barrel using a glass spigot to get out ourselves. I had never experienced this before and it was nerve-racking. LOL why? My hands were shaking, red wine was pouring out the side of the spigot. We tasted three different vintages. It was an amazing experience that we enjoyed so much. After our cellar tasting Marisol took us outside to the back of the building. Palm trees outlined the huge cathedral of stairs, where they have live music and party’s sometimes. Visitng and tasting such high quality consistent wines, all I felt was very lucky to have had such a fabulous experience. This place is beautiful and so are the wines. I will be a fan forever, many kudos to a great winemaker Steve Devitt. Looking so forward to visiting again and again! This entry was posted in Winery Visits and tagged Bordeaux, Cabernet Franc, Cabernet Sauvignon, Caravan, Chardonnay, Darioush, Duel, Exquisite, Pinot Noir, Shiraz, Spigot. Bookmark the permalink.